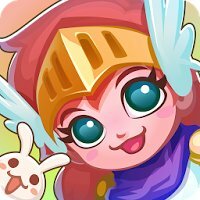 Free Download Adventure Town v0.7.0 APK For Android From RevDl.com. BRAND NEW adventure and city-building game, already with over 1 MILLION players! 5/5 – Lots of fun! !5/5 – This is an awesome game!5/5 – Love, love, love this game! Adventure Town is a charming new game with an fun mix of city-building with light combat elements. Rebuild your town and attract new Heroes to fight for your cause. Send Heroes to defeat monsters and explore dungeons in surrounding lands. Quests will guide, amuse and reward you. Start on this fantastic journey to restore greatness to your world and banish the forces of darkness! FEATURES:• FREE TO PLAY!• Build shops, houses and decorations to create your own unique town!• Attract and strengthen Heroes to defeat menacing monsters!• Fight Lord Darkness and his mega-evil Bosses in epic encounters!• Quests and a bounty board provide continuous challenges and rewards!• Compare progress against friends with full achievements and leaderboards! Internet connection NOT required to play!